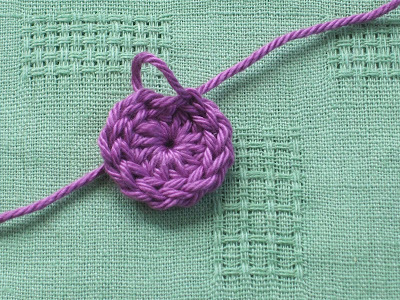 This is the button I came up with for my Thistle belt. It's quick to make and fairly sturdy. This pattern should work with any yarn and appropriate size hook (mine were made with Patons Grace yarn and a size F hook). 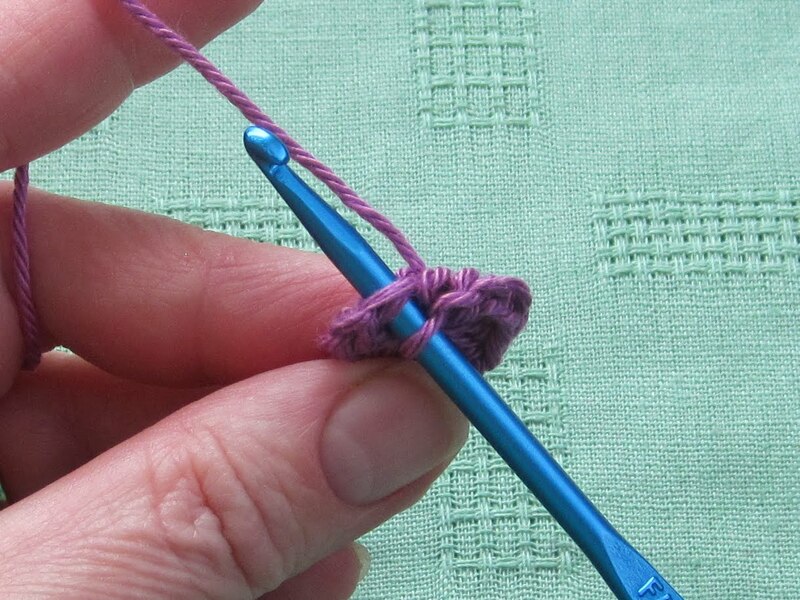 You will also need a darning needle. You can click on any picture to make it larger. 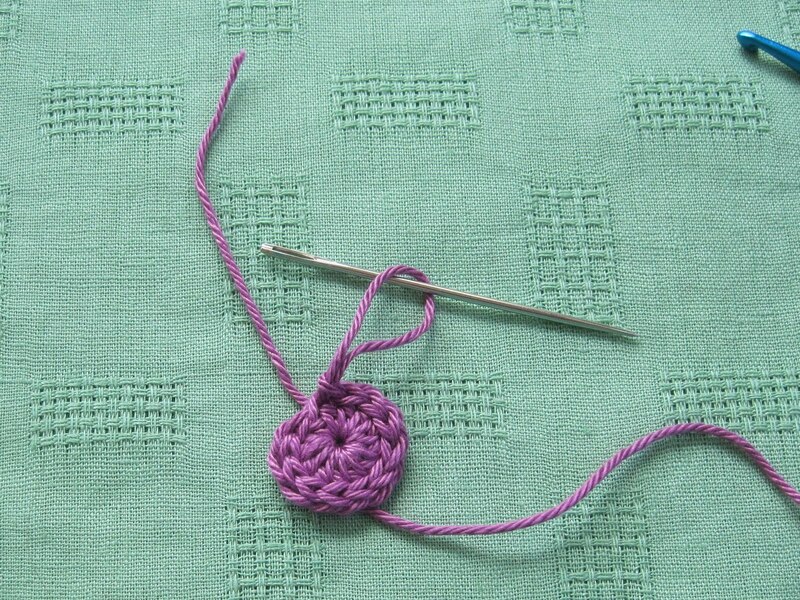 Chain 1, then half-double crochet 12 in ring. Tug on starting end of thread to close magic loop. 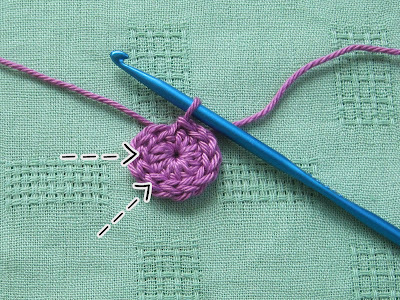 Slip stitch in first half-double crochet (hdc) to close the circle of stitches. 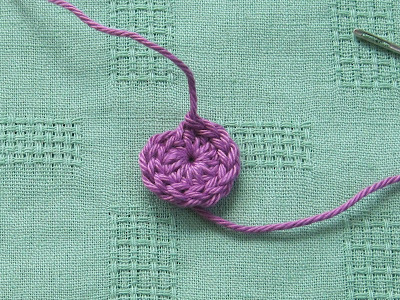 Slip stitch 11 more times with gentle tension, once in each hdc around the button. 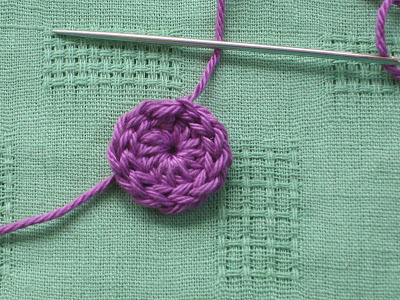 See how the slip stitches make a sort of braid sitting on top of the button? This is the front of the button, by the way. Cut yarn, leaving a 4-6" tail. Pull end of yarn up and out of stitch, but DO NOT TUG. We're going to make a nice seamless closure on the edge of the button. 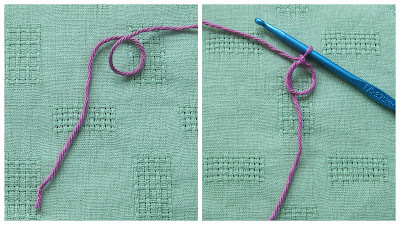 Thread yarn onto darning needle, then pass the needle through the next stitch to the left, from FRONT to BACK. 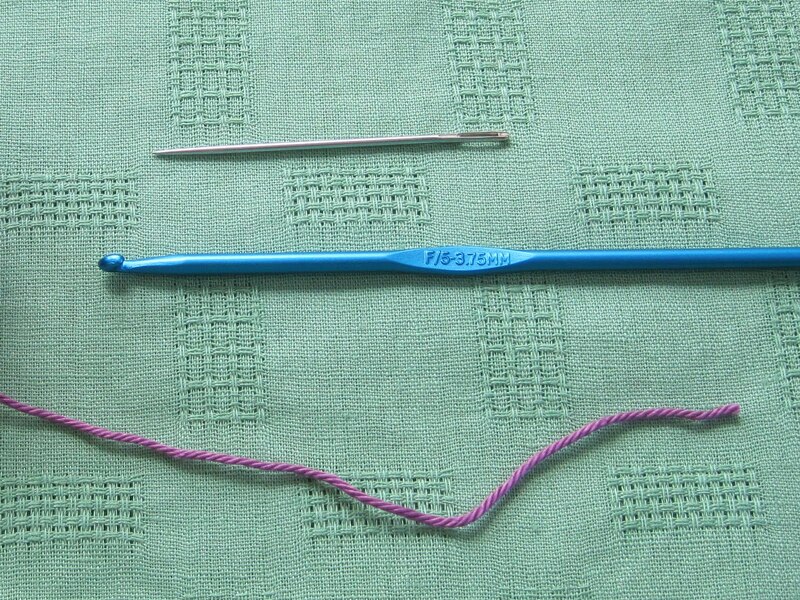 Now bring the needle to the right, and pass it from front to back through the back loop of your last slip stitch (where the thread was tugged out of the stitch). 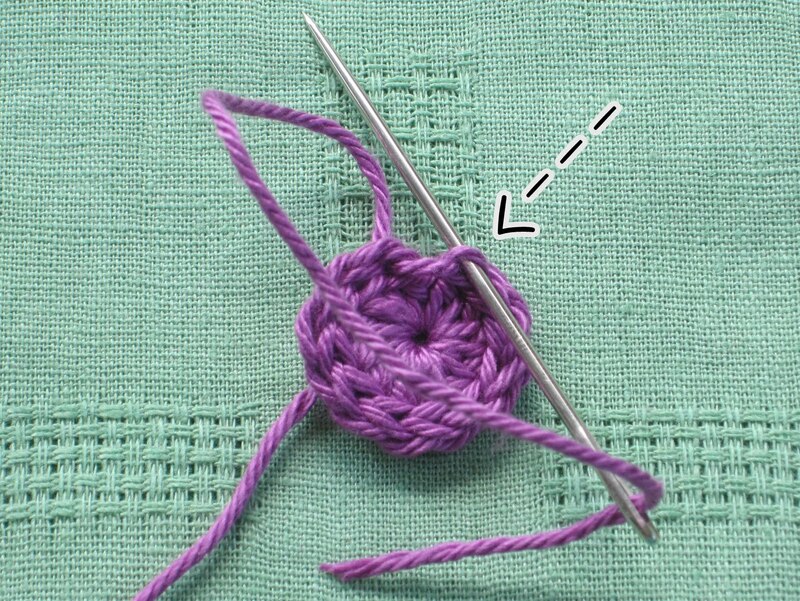 Pull gently to close the loop. Et voilà! A seamless edge. 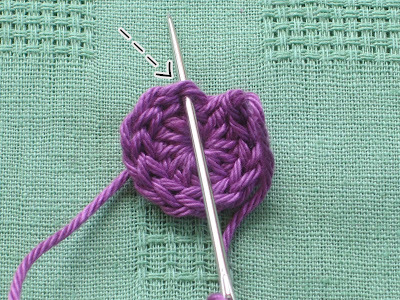 Turn the button over, and GENTLY pass the needle through the stitches on reverse side of button, to a spot that is on the opposite side of the center hole from the original yarn end. 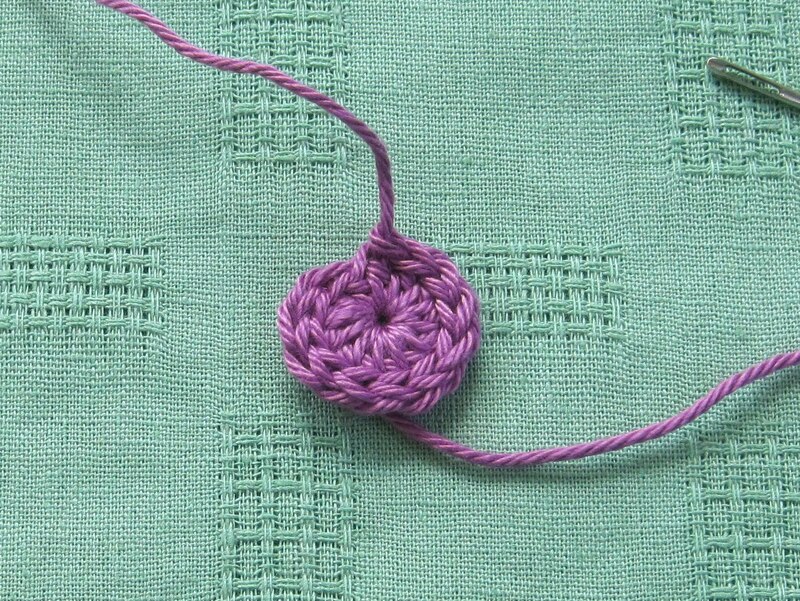 Gently tie the two ends in a double knot. And you're done! You can use these yarn ends to attach the button to your project. 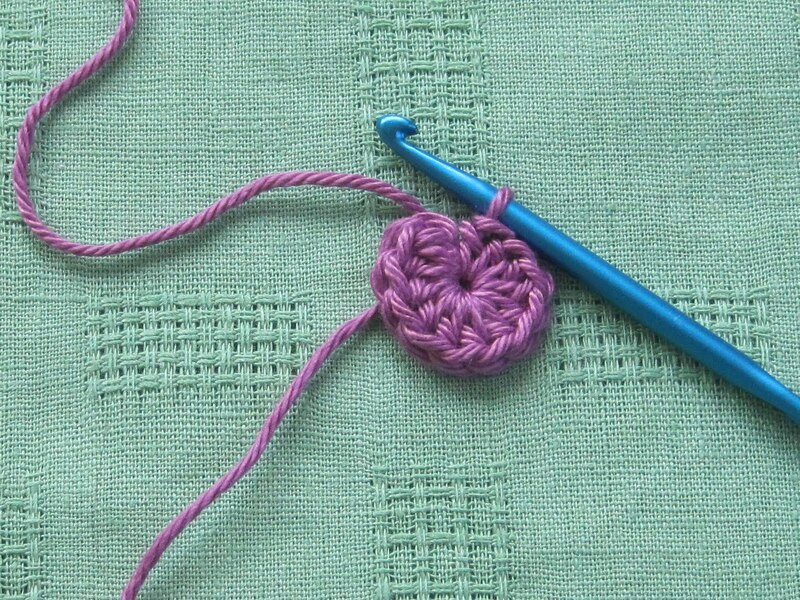 Note: it will behave like a shank button, attached in the middle but rather wobbly. 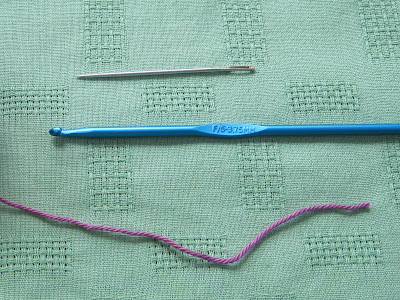 If you want your button to sit flush against your project without wobbling, thread each yarn end on the darning needle (one at a time) and pass back through a few strands on each side until the ends come out of the button about 1/4" apart. It will now function more like a traditional 2-hole button. 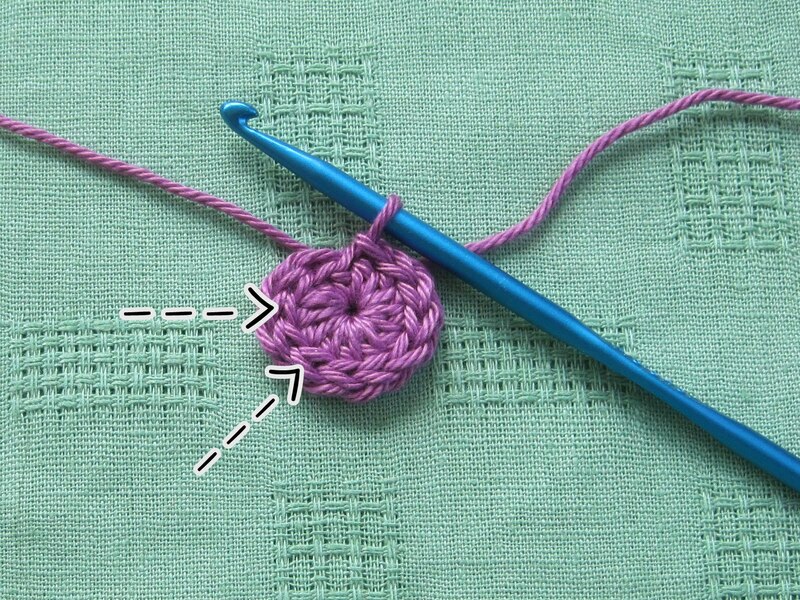 As easy and simple as this is, I think it is very very useful for a lot of people! :) I like how the slip stitches really finish the look of the button. Thanks gals! My buttons have passed the wear-test and seem to be working out well. 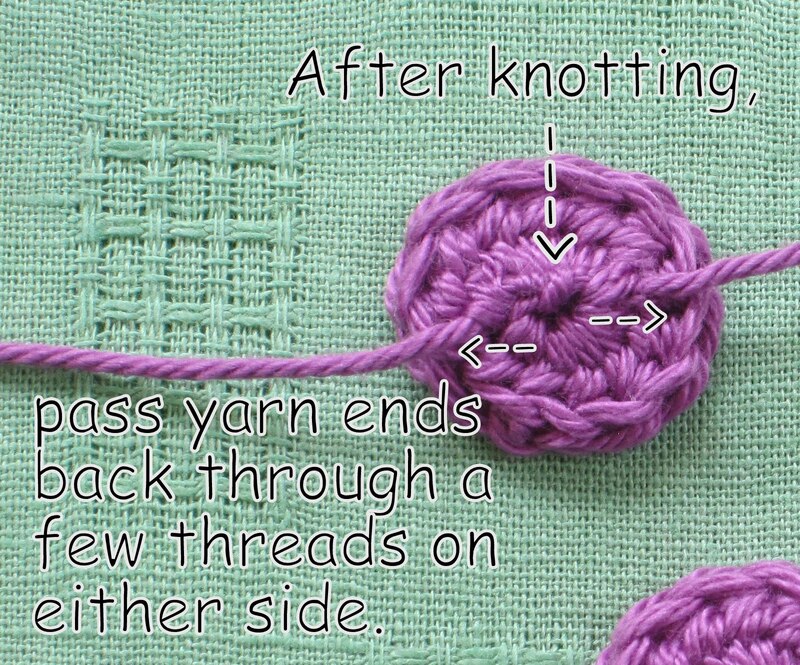 Once again, a beautifully photographed tutorial. Love the color you used, too! Mrs. M - Thank you so much. I used this pattern/tutorial and posted about the project here: http://appleblossomdreams.blogspot.com/2011/08/30.html. Thank you, Astri. So glad it worked out well for you and thanks also for the link! Thanks! 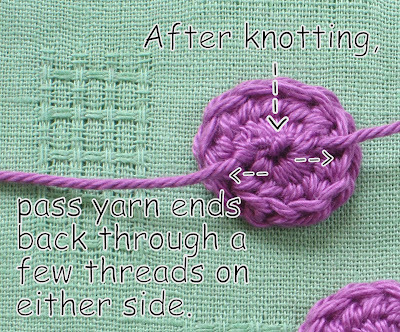 This was just perfect for covering up a magnetic closure on a purse I crocheted. This is great! I like to put them as the center of my flowers on baby blankets instead of buttons. That way I don't have to worry about choking hazards! Thank you. Thanks all! To yipsandhowls: I'm sorry about the link - it was to a blog that has been deleted. But I'm sure there are plenty of other Magic Ring tutorials out there. I found a great magic ring/circle tutorial courtesy of Moogly on YouTube: http://youtu.be/pK8vTCcVu-4 Thank you, Sue, for a great button pattern. 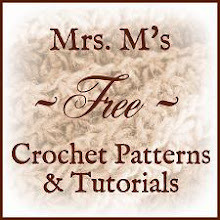 :-) I've added this to my fave patterns. 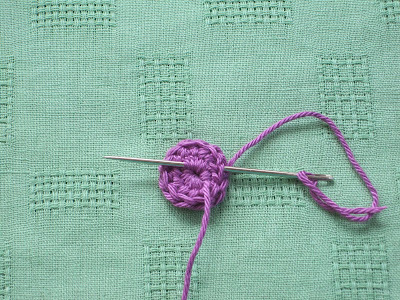 How do you make a larger button? 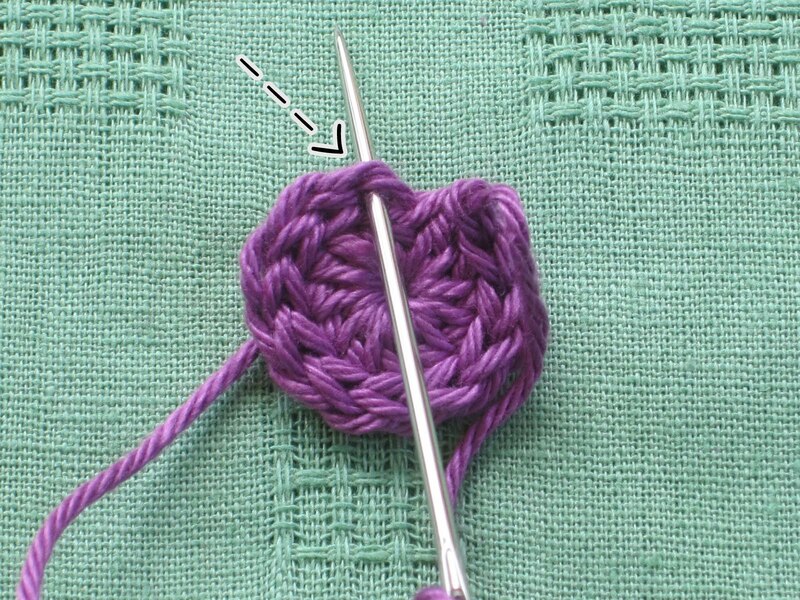 How do I make a larger button? Do you just continue to make more hddc in your loop? 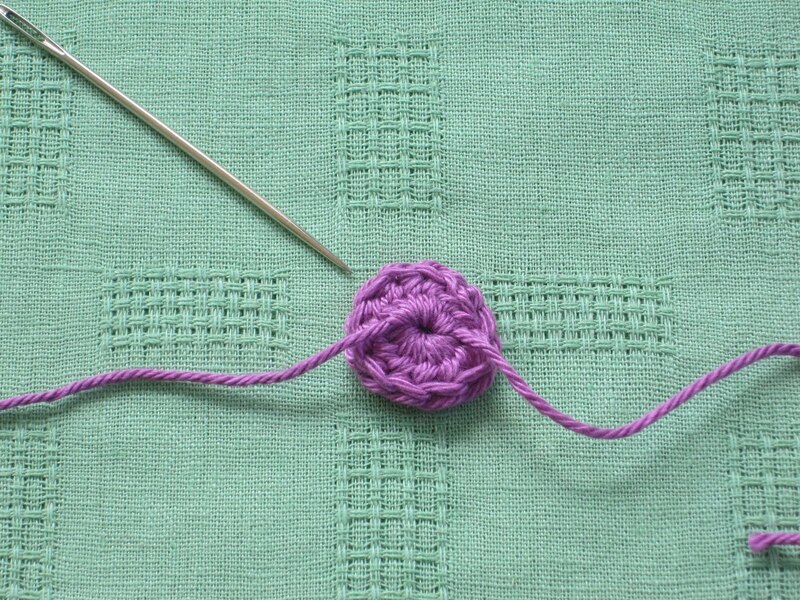 Wonderful Idea so simple and the perfect finish to any project . Thank you. 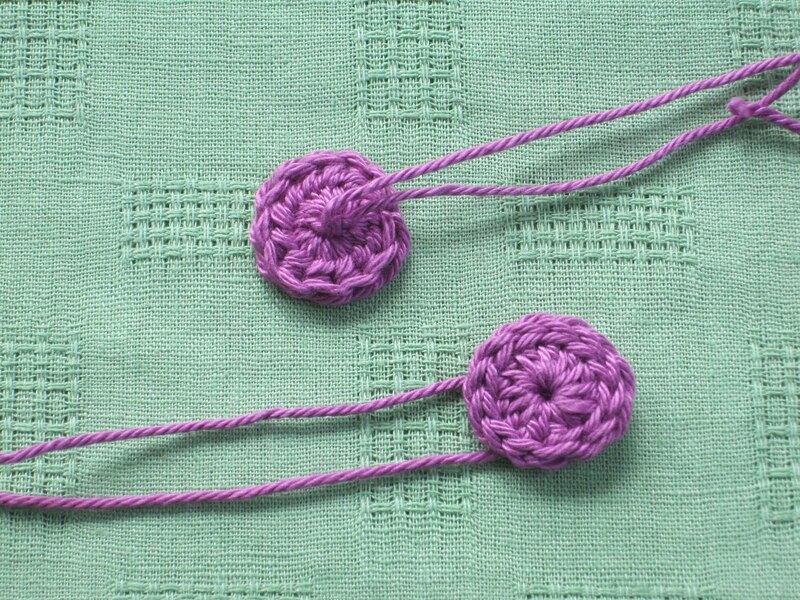 Brilliant thank you very much, these buttons will finish off my baby booties perfectly.